The Greater Richmond Transit Company says it will restore some bus service to Richmond’s Greater Fulton neighborhood, following community forums and a civil rights complaint. The GRTC Board of Directors voted earlier this week to run buses on the 4A and 4B bus lines every 15-minutes during peak commuting hours. Service to those routes was cut to every 30 minutes in January. Residents of the Greater Fulton, a historically working class, African-American neighborhood, criticized the cuts at a recent community meeting, saying it had made it more difficult for people to get to work in other parts of the city. Restoring bus frequency to the Fulton neighborhood was also one of the remedies outlined in a civil rights complaint filed by transit activist Omari al-Qadaffi last month. al-Qadaffi said the move is a good first step, but it doesn’t address what he sees as an overall lack of access to public transit for low-income and minority communities. 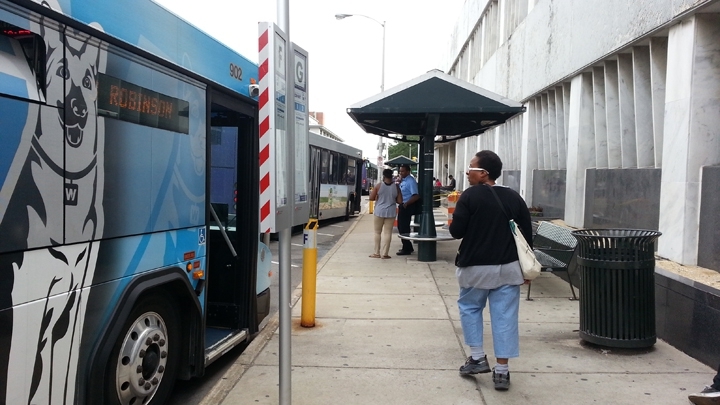 al-Qadaffi's complaint alleged that GRTC's major service overhaul last summer took away coverage from minority communities while expanding service in whiter, more affluent parts of the city. GRTC Spokesperson Carrie Rose Pace said the increased service is a response to feedback it received at community forums, not the complaint. The frequency cuts to the Fulton bus lines were due to low ridership numbers, GRTC officials said. Pace said those numbers have remained relatively unchanged, with roughly 1,500 riders on the 4A and 2,200 on the 4B each week. The cuts in Fulton were expected to free up nearly $750,000 that was going to be used to increase bus service in Southside and the West End. That will change now that some frequency in Fulton is being restored. “There will be less money to go around because we are reinvesting it in the 4A and the 4B again,” Pace said. The changes to the Fulton routes are expected to go into effect in May. The GRTC Board has also voted this week to extend service on the 87 route in Southside from 7-10 p.m.